Health Literacy, Domestic Violence Awareness, Celiac Sprue Awareness, Breast Cancer Awareness, Dental Hygiene, Down Syndrome Awareness, Infertility Awareness, SIDS Awareness, Pregnancy and Infant Loss Awareness, Dwarfism Awareness, among many others. German, Polish, Italian, Filipino and Hispanic History in the United States. October is a good time to educate yourself through awareness and also to celebrate our country’s cultural melting pot! October is also Pizza, Popcorn, Cheese and Sausage making month. Do you need another reason to have a party in your honor? All these foods go together beautifully! Here’s a fun fact: October 5th is the most common birthday in the United States. My lovely mother was born on this day. The theory behind this phenomenon is that if you count back a full term pregnancy from the 5th of October you arrive at…New Year’s Eve. Kind of makes sense when you think about it. So if you are still feeling unsure whether or not you need a reason to party this weekend, I will leave you with this thought. Your birthday (and birth month) only comes around once a year, and you deserve to make some memories. This entry was posted in Birthdays and tagged awareness days in October, Birthdays, Holidays, National Breast Cancer Awareness Month, October, October holidays and special events on October 19, 2013 by Georgeann. Today I am in pain, but yesterday was great. Yesterday was a good birthday. Several adoring fans (parents) called to sing to me off key, I received lovely cards and gifts, and I had a pretty wonderful day. I finally set up a Facebook account. Please stop laughing at me. I know that I mentioned in my previous post that I do not do technology. For years now people have been asking me why I don’t have Facebook and I had so many good answers: creepy stalkers, Taliban spies, baby photo thieves, computer hackers, not enough time, carpal tunnel syndrome, PMS… the list goes on. But now I really do need Facebook to help me network. All I need to do is Friend ten million people on Facebook and convince them to read my blog and then I will be set. Simple enough! Anyway, impossible dreams aside, my birthday was awesome. I got to do mostly what I wanted. I did still have to go to work, but what I do for money is a pleasure. Whoa! Let me restate that. What I do for money involves kids. Hmm, somehow that’s worse. Might as well just say it: I work as a noon aide at the neighborhood school, so for a few hours each day I basically herd 400 unruly children between playground and lunchroom, scolding and consoling in turn. I am sort of a mix between Mary Poppins and R. Lee Ermey. There are many reasons why I like this job. Although I am not being paid hand over fist, I get to work minimal hours and I get free time for the rest of the day to do things like run errands, take naps, exercise, and hey, blog! I also get to see my own children at the school, and who hasn’t had the dream of literally being paid to yell at their own kin. An unexpected bonus of this job, and the reason I love going to work, is that I have learned so much about myself and humanity through the eyes of children. It is amazing and humbling to be around a group of tiny people who put so much trust in you and depend on you so completely to wipe away tears, solve territory disputes, organize schedules, and be a disciplinarian without being a tyrant. Very humbling indeed. So I try to temper my drill sergeant spasms with sugary sweetness and have found that my method seems to be working. The kids I have yelled at the most over the last year love me the most and give me the most hugs. Go figure. So after being hugged by more adoring fans at work I still had kids hanging out at my house (again the perils of being a favorite noon aide) and once I chased them off it was party time. 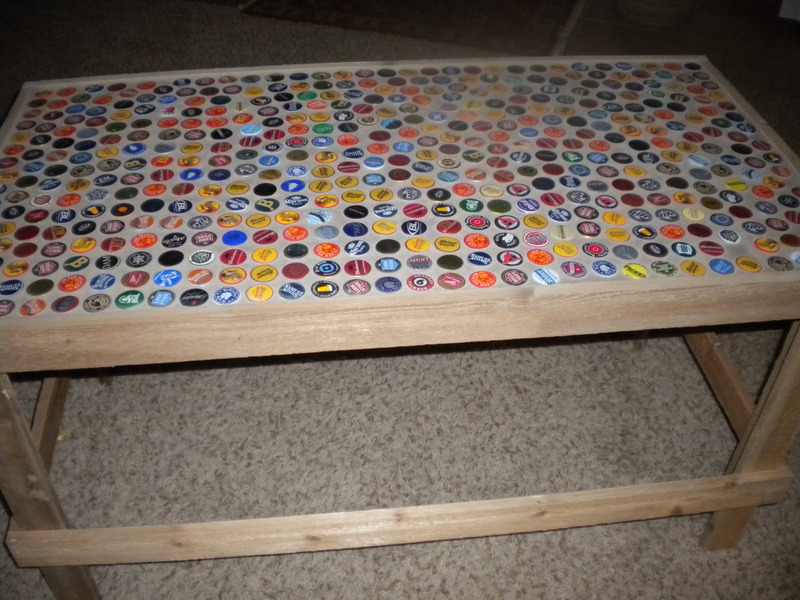 The hubby and girls surprised me with the most beautiful handmade outdoor coffee table, with a beer bottle cap grouted top! They had been not-so-secretly working on it in the garage for several days and had hidden it under a sheet. It is so cool, and I am afraid to put it on the deck and subject it to ugly Kansas weather, but I also can’t wait to sit on the deck when the sun comes up and have coffee on my new coffee table! We also went out for dinner at my current favorite local Mexican restaurant, La Fiesta. I like going there because the wait staff is very willing to coordinate with the kitchen staff and accommodate my several annoying food sensitivities, and the food is quite delicious. Everything was going great until a horrendous migraine struck and I ended up curled up on the floor of our living room after the rest of the family went to bed. Coincidentally, that is how I found the sweet, secret birthday message that my husband and girls wrote in marker under the coffee table. It made me feel a little better. It’s the little things, ya know? This morning I have a migraine hangover and feel every second of my 32 years. Today will be especially rough. Migraines always leave me loopy and weird, not the best way to start out a new year of life. Life in Kansas has been rough on our family. I can’t say living anywhere else would be easier, but it has been difficult to the extent that I cracked a joke to my neighbor one day: “I’m not Catholic, but I think we are in Purgatory”. A devout Catholic, she laughed, and continued to be on speaking terms with me. I must be on to something. My super cool new coffee table, hand made by angels! 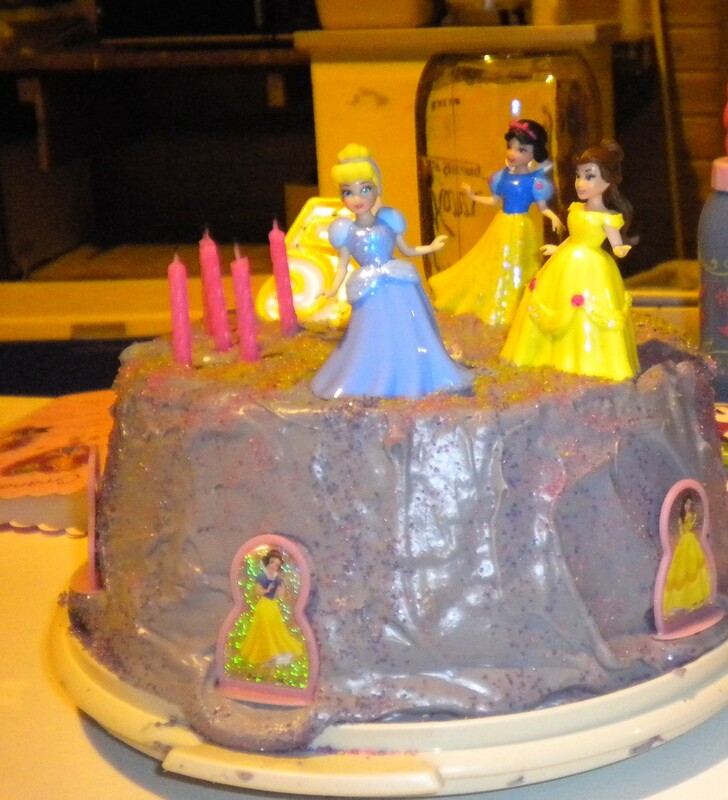 This entry was posted in Birthdays, Discoveries and tagged Birthdays, discovering Facebook, Facebook, starting new hobbies on October 10, 2013 by Georgeann.